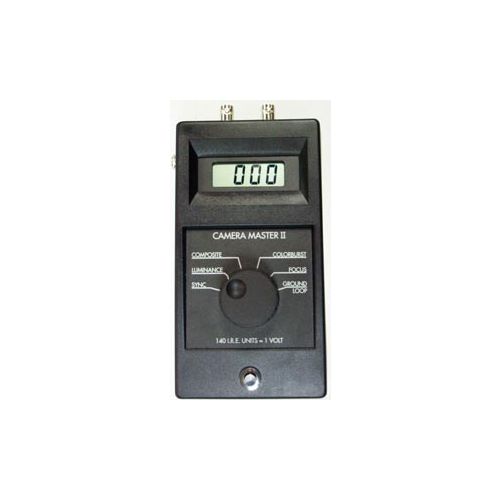 The Camera Master II is a digital, hand-held, battery operated meter that can be used to DIGITALLY test camera focus, and measures sync, luminance, composite, colour burst and ground loop. Use it for fast and accurate set-up of any video source. FOCUS Used to adjust camera for best focus on scene. Maximum meter reading occurs at sharpest focus. The digital read-out eliminates subjective guess work. SYNC (40 IRE Units) Use this to check for correct end of line terminations and camera sync output level. LUMINANCE (100 IRE Units) Enables the camera Iris to be accurately adjusted to the correct brightness setting for uniform level and to prevent DVR overload. COMPOSITE (140 IRE Units) Measures the peak to peak level of the video signal. 140 IRE Units = One Volt of video. COLOR BURST (40 IRE Units) Measures color burst amplitude on the Back Porch of video. Used to measure cable slope loss at high frequency and adjust video amplifiers. GROUND-LOOP This measures the troublesome 60Hz ground loop voltage that causes Bars on the video picture. You can use this measurement to verify that no ground loop exists in the video before you leave the job. CAMERA MASTER II The Sync, White, and Composite amplitude measures the sync-to-white ratio and the overall video waveform amplitude on any part of an NTSC CCIR (CCTV) or PAL video system, including camera origination, video levels in Distribution Amplifiers, Video Switchers, CCTV installations, Studios, Microwave and Satellite transmission systems. 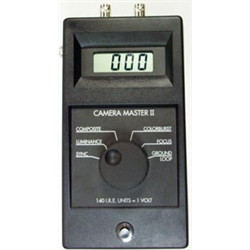 The hand-held battery operated CAMERA MASTER will allow you to take video measurements anywhere. You will be able to trouble-shoot camera installations and do the job faster with confidence.